EMS Agenda 2050 presents a compelling vision for a people-centered EMS system. In this webinar, hear from some of the EMS leaders who were responsible for gathering input from across the profession and turning it into a cohesive vision. They explain why the creation of the Agenda is just the beginning of the process and talk about how they plan to turn it into a reality. First developed more than a decade ago, the National EMS Scope of Practice Model defined the knowledge and skills necessary to achieve competence for each of the four levels of EMS clinician: EMR, EMT, AEMT and paramedic. The 2018 revision marks the first significant update in more than a decade and is sure to have an impact on the education, credentialing and licensure of EMS clinicians for many years. In this webinar, you’ll learn why revising the Model was so critical and how changes within the profession and medical science over the last decade influenced its content. The panel also provides insight into many of the decisions they made when writing the Model. You’ll also learn the progress being made to revise the National EMS Education Standards. More than 250,000 people experience out-of-hospital cardiac arrests in the U.S. each year; less than half of them receive bystander CPR before professional first responders arrive, even though early CPR is known to greatly increase an individual’s chances of survival. In this webinar, leaders from the fire and emergency communications center in Bend, Oregon, discuss how their organizations partnered to improve cardiac arrest survival rates in their communities through a collaborative approach to telecommunicator and high-performance CPR training and focused improvement to response and outcome measurement. They also review CPR LifeLinks, a national initiative to implement these enhanced CPR programs with a how-to guide for EMS and 911 agencies. As EMS continues to embrace technology, collecting patient data has never been easier. Local and state EMS organizations are gathering more and more information, but many wonder how to effectively use it. Some agencies, including Gold Cross Ambulance in Utah and JFK Medical Center EMS in New Jersey, discuss how they’re using data not only to improve performance, but to demonstrate the value that EMS provides to patients and communities. Mass casualty incidents usually don't obey jurisdictional boundaries, with responses often involving multiple agencies, regions and even states. Several years ago, to help ensure consistency when responding to these incidents, a group of experts created the Model Uniform Core Criteria for Mass Casualty Incident Triage, or MUCC. While not a system of triage itself, MUCC created a standard set of guidelines that all mass casualty triage systems should follow. 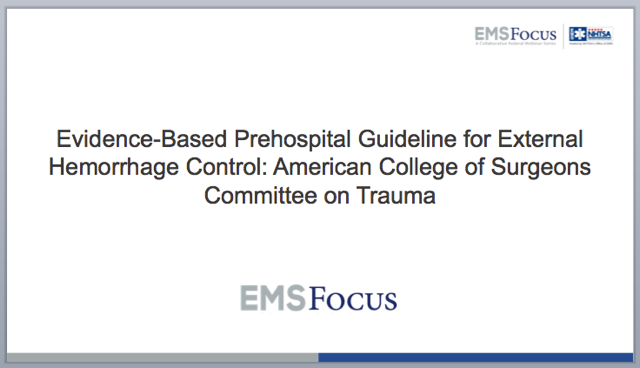 Upon the recommendations of the National EMS Advisory Council and the Federal Interagency Committee on EMS, instructional guidelines were then developed to help EMS educators teach the basics of MUCC during initial and continuing education for all levels of EMS personnel. The three-member panel discusses the importance of using evidence-based triage systems during the response to mass casualty incidents, what educators need to know about the model uniform core criteria, and lessons learned during implementation of the new MUCC EMS instructional guidelines.